A Perry woman will avoid trial in the starvation death of her adoptive daughter but will still spend the rest of her life in prison. Misty Ray, 41, plead guilty to kidnapping charges Wednesday. Other charges, including first-degree murder, were dismissed but the crime of first-degree kidnapping carries a mandatory sentence of life in prison with no chance of parole. Misty Ray will be sentenced on January 18 along with her husband, Marc, who plead guilty last month to child endangerment causing death and three counts of third-degree kidnapping. Their adopted daughter, 16-year-old Sabrina, weighed just 56 pounds when she died in May of 2017. 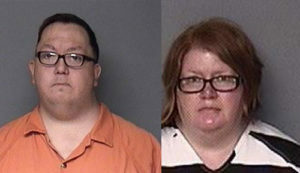 Prosecutors said Sabrina and two other adopted children were often locked in bedrooms. Three other family members were charged in connection with Sabrina’s death. Two of them are now serving prison time.